BOYNTON BEACH — The Boca Raton Resort & Cluband Habitat for Humanity South Palm Beach County recently completed a home built for the Frederick family in Boynton Beach. The Boca Raton Resort & Club sponsored the home with a $70,000 donation to provide a new and safe place for Antonica Frederick and her daughter, Ayanni. Over the past five months, Antonica, Habitat for Humanity volunteers, and Boca Raton Resort & Club associates and staff members, put in hundreds of hours working together to finish the house. The Frederick home is the second Habitat for Humanity project that the Boca Raton Resort & Club has financially supported in South Florida. The company has provided volunteer labor on three other homes as well. “The Boca Raton Resort & Clubis proud to help the Frederick family as we continue our support of worthy causes that impact those areas in which we live and work,” said Sandra Tagliavia, director of human resources for the Boca Raton Resort & Club. The donation was made through the Community Contribution Tax Credit Program, which provides an incentive to encourage Florida corporations to make donations toward community development and low income housing projects. Corporations located anywhere in Florida that make donations to approved community development projects may receive a tax credit equal to 50 percent of the value of the donation. Businesses may take the credit on Florida corporate income tax, franchise tax, or insurance premium tax. 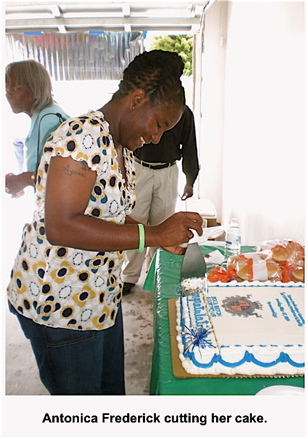 Antonica’s family support partner Helen Bass, presented the keys to the new homeowner. The Family Support program enables Habitat for Humanity families to foster partnerships, instill pride in homeownership, and develop skills and knowledge of home construction and proper home maintenance. Every Habitat homeowner, in addition to completing the required minimum of 500 "sweat equity" hours, is required to participate in a series educational workshops that address financial literacy, cleanliness and home maintenance, preventative health care, effective parenting, hurricane preparation, energy conservation, and more. Special thanks to all of the pro bono contributors: All Point Screw, Bolt & Specialty Co.; Classic Cultured Marble; Deerfield Builders Supply; Dixie Blueprint Service, Inc.; Ferguson Enterprises; Gen-Energy, K&P Mechanical Solutions; Kevin Holler; K-Rain, Inc.; Professional Supply Co.; Square D; Sunflower Lanscaping & Maintenance, and Whirlpool Home Appliance. Other supporters included: Atlantic Exterminating; Chamberlin Air, Inc.; Distinctive Kitchens & Baths; Electronic Door Lift; FPL Build Smart Program; O’Brien, Suiter & O’Brien; Pro-Crete Services, Inc.; Richard Jones Architecture, Inc.; Ridgeway Plumbing; Robert Agsten LL, Engineer; Southern Building Products; SRTDA Business Services; and TM Window and Door. Many volunteer groups and individuals helped build the home, including: Assa Abloy; Boca Raton Resort & Club; Break Through; Calvary Christian Academy; Donna Klein Jewish Academy; Faith United Methodist Men’s Group; Alpha Psi Lambda, Delta Sigma Theta and Theta Phi Alpha at Florida Atlantic University; HR Team; I Can Benefit; Junior League of Boca Raton; Nokia Siemens Network; Renfrew; Rotary Club of Boynton Beach/Lantana; SpringHill / Towne Place Suites; United Storage; United Way – Nordstrom; University of Miami School of Medicine; and VTT Properties. Habitat for Humanity South Palm Beach County was incorporated as a nonprofit organization in 1991 and supports the communities of Boca Raton, Boynton Beach and Delray Beach. The Habitat process goes back to the traditional values of reward through effort. Each partner family is required to invest 500 hours of their own time in the construction of Habitat homes with the majority of hours being invested in their own home. They must then pay back the actual cost of the home through a non-interest bearing mortgage, with monthly payments of principal, taxes, and insurance. This system builds self-esteem in the partner families. On almost any given Thursday, Friday, Saturday or Sunday, volunteers are invited to work on a house in the community. Two more home dedication ceremonies will take place in June; one in Delray Beach and one in Boynton Beach. The public is invited to attend and can find more information on www.habitatsouthpalmbeach.org.